During the summer of 2016, we implemented our education program to take place at Mortimer Community College, South Shields. Over the course of a few weeks, we worked with a class of Year 7s, introducing them to the project as well as a presentation of our primary findings. Over subsequent lessons, we focused in on the Shields Gazette newspaper article that details the detention of Salem Abuzed in Ruhleben, Germany and his return to South Shields. This first-hand report along with photographs of Indian troops on the Western Front were used to generate the students’ own responses to this hidden history of the First World War. What was created by the students were amalgamated into three poems that featured within our Tyne and Wear Metro Campaign. From August to the end of September 2016, within each carriage of the Metro train system, a total of 240 carriages, we had a placard exhibiting one of these these poems along with visuals designed by Dawn Felicia Knox. 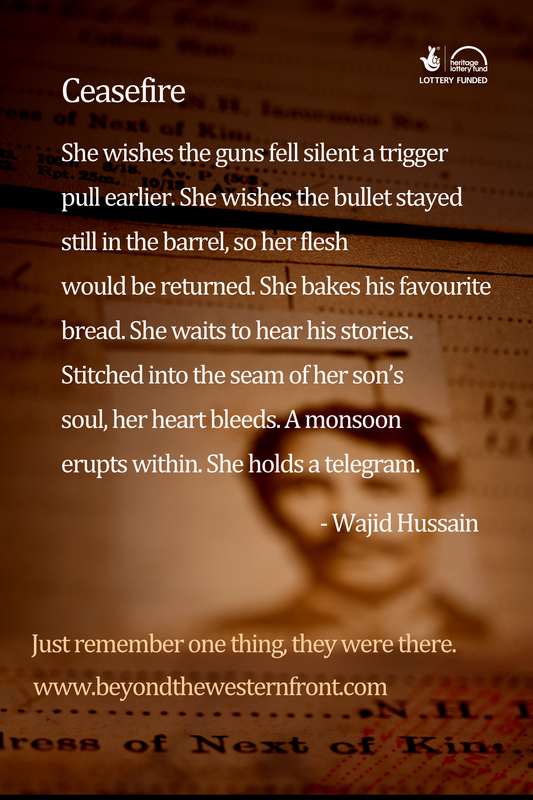 These creation sat alongside station posters featuring a specially commissioned poem by Wajid Hussain detailing his response to Black, Asian and ethnic minorities involvement in the war. All the public transport campaign creations can be seen here, for the first time, together. Link to the educational resources can be accessed here.